Follow on forces, intelligence, reconnaissance, and logistics ought to be the subsequent steps for NATO to adapt to the Russian threat – these are the conclusions of the Baltic Sea Security Conference. Good intelligence and reconnaissance enabling deeper understanding of our security environment and rapid decision-making ability – these are the key aspects for improving security in the Baltic Sea and the NATO’s Eastern Flank, according to the panellists of the Baltic Sea Security Conference. The participants also took notice of the Russian propaganda efforts, directed at portraying itself as a victim, rather than the cause of rising tensions, and called for these narratives to be countered Furthermore, it was emphasised that Russia’s growing military potential in the Western operational theatre constitutes a serious security threat. “Reactivation of the 1st Guards Tank Army and creation of three new divisions are not responses to the decisions made by NATO during the Newport or Warsaw summits – those actions have been taken long time before that”, one of the panellist observed. The second edition of the conference was designated to continue discussion about the security of the Baltic Sea – a region that has become area of an increasing tension between the West and Russian Federation. This rivalry forces the European Union members states to deepen their cooperation on the security level. The Conference also aimed at assessing potential for ensuring security and stability in the region, as well as analysing the potential for future cooperation between the military and defence industries. “Russian actions are not a response to the NATO’s Eastern Flank reinforcement. They stem from Russia’s threat perception and a long-term strategy”, Mr Pisarski emphasised. “Russia perceives NATO as an enemy and adjusts its policies accordingly. We must realise that our steps undertaken during the summits in Wales and Warsaw are solely an ad hoc response to the Russian threat to the region. NATO needs to begin a long process of adaptation to restore its lost capabilities of the collective defence. It will require a broad review of the command structure, logistic infrastructure, strengthening anti-aircraft and antiballistic defence capabilities. In the light of Russia’s violation of the INF Treaty, it should be put under scrutiny whether NATO’s ballistic missile defence should remain focused on the Middle Eastern threats. Mr Pisarski’s speech was followed by Minister Bartosz Cichocki’s address, in which he argued that the Baltic Sea is of key importance for Poland and other countries in the region. The Baltic Sea constitutes our natural defence zone, our strategic depth, allows for our participation in the world trade and guarantees our energetic security, Mr Cichocki stated, reminding the recent shipment of American liquid natural gas (LNG) arriving at the Świnoujście terminal via ship freight through the Baltic Sea. He warned that “Polish economy’s dependence on exports reaches 45% and prognoses estimate this dependence to grow up to 60%”. At the same time, Mr Cichocki highlighted the deteriorating security environment in the Baltic region: “Russia’s growing assertiveness the focus of our present analyses and actions”. In the course of the conference General Jarosław Kraszewski, (Director of the Armed Forces Command Department in the National Security Bureau?) unveiled the Strategic Sea Security Concept of the Republic of Poland. The document was originally presented on the 10th of February 2017 in Gdynia, on the anniversary of Poland’s ‘marriage with the sea’. General Kraszewski recalled the words of President Lech Kaczyński: “Poland needs to turn to the sea”. He emphasised that it was the first time since the Second World War that a document outlining a sea strategy was developed by the Polish Armed Forces/Navy. Authors of the Concept warn that the current potential of Polish Navy is not adequate to existing threats. It was created with an underlying conception that “the Baltic should be a problem for Russia, not conversely”, General Kraszewski said. However, reconstruction of the Polish shipbuilding industry should be accompanied by international cooperation, as Poland is not capable of handling all the challenges on its own. General also brought up a question whether sea programmes should not be financed in the manner similar to the F-16 programme. General has also mentioned the issue of insufficient funding, and the need for additional financing being made available for naval programmes, very much like in the case of F-16 program. The first panel dedicated to growing threats in the Baltic Sea region was preceded //followed// by a presentation of Dr Philip Petersen, vice-president of the Potomac Foundation. He outlined findings from the war game conducted by the Potomac Foundation and the Pulaski Foundation alongside General Philip M. Breedlove, a retired Supreme Allied Commander Europe of NATO Allied Command Operations. Jacek Najder, a retired Polish ambassador for NATO and Undersecretary of the State in the Ministry of Foreign Affairs was a part of the team of experts addressing the problem of NATO’s adequate response to Russia’s increased military activity in the Baltic Sea. “Good recon enabling deeper understanding of our security environment, and rapid decision-making capability” – those were the key aspects necessary/needed for strengthening regional security, according to Mr Najder. Michał Miarka of the Security Policy Department of Ministry of Foreign Affairs has briefed those in attendance on the implementation of decisions made during the Warsaw NATO summit. Asked about upcoming goals for NATO, he pointed out that part of the objectives set in the course of the summit is already in process of realisation, whereas many challenges stem from outside the Article 5. As for the future objectives for NATO, Mr Miarka included increasing the size of the reinforcement forces, as well as improving logistic, and the ISR(Intelligence, Surveillance, Reconnaisance) capabilities. Laurynas Kasciunas, member of the Lithuanian National Security and Defence Committee, advised that an alarm has sounded for the region. Despite its initial negligence in the area, Lithuanian defence spending has increased. “Conscription has been restored. Tendering system has been reformed to fight corruption. Security and defence have become a priority.”, he assured. Jacek Najder, a retired Polish ambassador to NATO and an Undersecretary of the State at the Ministry of Foreign Affairs, talked about the need for strategic threat assessment, good recon intelligence, and monitoring, as well as immediate threat response capability. We ne an improved and swift decision making process. “Good recon and analysis will not help us if we cannot make up our minds and act in a short period of time”. Furthermore, NATO ought to have a command structure that is adequate to potential threats. For instance, Mr Najder said, at times it takes NATO 24 hours to organise a meeting. Within that time, Russia can – allegedly – deploy two brigades. He also emphasised the importance of conducting war games which may “indicate potential weak points and areas where improvement is needed”, and encouraged to conduct them more frequently. Michał Miarka from the Policy of Security Policy? Department at the Ministry of Foreign Affairs stated that Russian military exercises like ‘Zapad’ which took place in Belarus, can serve as a proof for the West of the nature of Kremlin’s actions. In that context, they constitute a chance to expand and deepen the understanding of Russia’s motivations. “Russian military exercises can be used to draw a more detailed picture for our Western partners”, he said. With regards to various initiatives undertaken in order to initiate dialogue with Russia, Mr Miarka reminded that it is hard to talk of any dialogue when both sides understand the word differently. Given that the majority of Russian exports pass through the Baltic, he advised for putting greater attention on the Danish Straits. Jacek Najder warned not to fall into a trap of succumbing to labelling any assertive response to Russian aggression in the region as ‘escalation’. The retired ambassador deemed this approach as extremely dangerous as this narrative could be accepted as factual by the general public. He recalled the Russian aggression in Georgia and Ukraine in 2008 and 2014 respectively, with the latter resulting in the annexation of Crimea, and underscored that Russia allegedly attempts to saw discord in various states such as the US or the Netherlands. Mr Najder considered Poland to be resistant to the Russian provocations yet he added: “narration about the ‘escalation’ of conflicts [by the victims] needs to be countered. Otherwise, just like with a self-fulfilling prophecy, it will start being considered true”. “The narratives needs to be clarified”, he said, pointing to the fact that it was Russia, not the European countries that commenced military exercises on a massive scale first. “It is Russia that constantly raises the stakes, not us”, he added. Laurynas Kasciunas from the Lithuanian National Security and Defence Committee said that while our region was in the phase of focusing on intimidation, the time had come to focus on building up our defence capabilities. Bruno Lété from the German Marshall Fund of the United States argued that we could draw from our experiences in the Baltic Sea while approaching challenges in the Mediterranean. “We need a 360 degree approach, lessons learned in the Baltic Sea can be applied in other parts of Europe”, the expert said. Panellists discussed security in the region in the context of increased activity of Russia’s aircraft in the Baltic Sea area and reports about Russia sending corvettes capable of launching “Kalibr” cruise missiles. 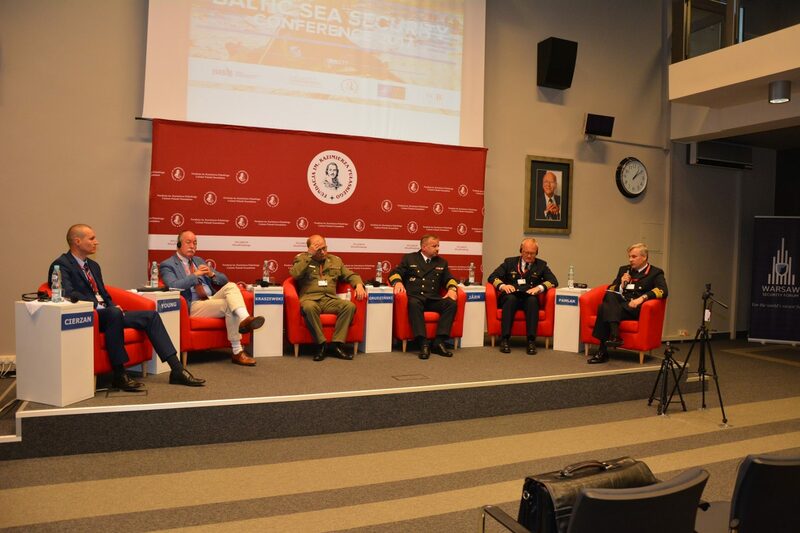 Subsequent panel’s topic was the future of Polish Navy in the context of the Russian threat. Thomas-Durell Young from the Center for Civil-Military Relations at Naval Postgraduate School in Monterey, California, argued that Russian anti-access area denial capabilities (A2/AD) needed to be addressed as they disrupt access to the potential war zone. He encouraged research into potential means of countering this threat, including utilising cyber domain and drones the search for creative solutions that include cyberspace or drones, emphasising that Russia should not be underestimated. “We strive for peace whereas Russia strives for victory. Nobody knows how she defines it”, he said. Mr Young argued then that we need start thinking in war-time terms – in his opinion Vladimir Putin has already declared it. There is a need for creativity in approach, coupled with willingness to experiment, rather than risk avoidance and extended analysis, as this may wll result in us falling behind We need to experiment instead of waiting for everything to be analysed as this can result in us falling behind. He was adamant that in case of conflict, the first shot would be fired by the Russians. Lastly, he said that in our region the combat sharpness and readiness has been lost. Throughout the conference, Kamil Mazurek from the Casimir Pulaski Foundation had the possibility to talk about a tri-seminar that took place in the Pulaski Foundation with representatives of the armed forces and producers interested in providing the Polish Navy with a number of new generation submarines. Dr Philip Petersen, vice-president of the Potomac Foundation, presented his simulation of a hypothetical Russian aggression. He emphasised graveness of the situation, indicating that anti-tank capabilities and systems ought to be prioritized. The expert assessed that the Russians returned to the strategic management and that at present they work on gathering troops and units in a given time. General Waldemar Skrzypczak emphasised that achieving air superiority, and severing lines of communication would be Russia’s primary objective. He further added that the lines of communication would be targeted in order to disperse our forces. In his estimate, Poland is two divisions short of being able to effectively pursue delaying action. Possible future scenarios were presented by Andrzej Wilk of the Centre for Eastern Studies. His conclusions were following: firstly, when planning modernization of our military forces we need to examine the steps taken by our potential adversary – due to technological progress, prognoses should not exceed three to five years. Secondly, Poland and NATO place too much importance on the so called Suwalki Gap, whereas for Poland the Brest direction would be crucial. The last forum was dedicated to the anti-aircraft and anti-ballistic defences. Representative of the Armament Inspectorate outlined the progress of the ‘Wisła’ and ‘Narew’ programmes. Negotiations are in progress however, for various reasons time of their conclusion remains unknown. Mark Gunzinger of the CSBA (Centre for Strategic and Budgetary Assessments) said that at this point in time a scenario involving a hybrid, informational war is the one considered to be most probable. Therefore, this hypothetical conflict could differ from what is commonly perceived as a conventional military conflict. As far as the European theatre, he was most concerned about the cruise missile development. Jen Judson (Defense News) further commented on the situation of the American military industry. According to the panellists, NATO members have not responded adequately to the quantitative and qualitative increase in threats in the Baltic region. While defence systems of individual members are set to become integrated and inter-operational, Russia still has technological advantage over the allied forces of NATO. Particularly worrying is a gap in the short-range anti-aircraft defence, SHORAD. The United States lack modern systems of that kind whereas completion of the Polish ‘Narew’ programme is delayed. In order to increase security of the Baltic airspace, cooperation of the countries in the region must be tightened; the missile defence complex in Redzikowo Poland, should be equipped with antiballistic missiles; the work on THAAD system should also be initiated.